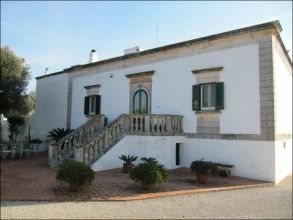 For sale in Ostuni farm 2 km from the sea, beautiful 19th century farmhouse with sea view, completely restored. The farmhouse, which develops on two levels for a total area of ​​approximately 600 square meters, is completely fenced and has a garden of approximately 2800 square meters and a citrus plant of about 700 square meters. at the farm there are 5 hectares of olive groves with more than 200 ultra-aged trees and almonds. The structure has a number of rooms with starwheels and carriageways, with a small depandance, garage and storage on the ground floor, while the noble floor consists of a large living room with sea view, a study, a kitchen, two bathrooms one of which is one of two double bedrooms, and a laundry room. The bedrooms have a beautiful view of the White City while the studio and the living room look out over the olive trees and the wonderful sea of ​​Ostuni. The whole structure rests on an ancient 1700s perfectly preserved and accessible hypogeum crushed by a 1400th hypogeum crusher. The architectural and architectural charm of the structure makes it a unique piece of our territory. The property is equipped with autonomous heating, alarm system, Imhoff pit, wood-burning oven and numerous tanks that ensure adequate water independence. The farmhouse is ideal for both private style and charming hotel activities.